While waiting for friends to show up, I was attacked by a mob of kids going after my hoops. I was outnumbered and overcome. For a while I frantically tried to make sure that they weren’t wandering toward the road (with hoops), throwing the hoops around, or hitting each other. Eventually I just stopped and laughed at the chaos of it all!!! And took photos on my phone. Eventually the flash mob moved on, and I was left to hoop and spin poi and convince passers by to try it as well… The music was much different than what I usually hoop to, but I knew many of the songs and it was a pleasant time. I’ve been quiet over here, between PDF, work deadlines, and all that kind of fun stuff… but I’m still here! This month is a whirlwind and I already don’t know where May went, so I expect it to go faster. Next – Figment! I may be going with a Buttafly, as Random will have a bachelor party that night. The next weekend is Random’s birthday (June 21) and the wedding that he is officiating for his friends (the above mentioned bach parties) on June 20, so we’ll be down the shore. After that, June 26/27 is a garage sale hosted by the Deviants (come shop! sell! contact me for info!! It’s in Lake Hopatcong) and that Saturday night, anyone who plays with fire should contact me about hanging out and doing such nonsense in honor of Random’s birthday. My limited photos from PDF are here – some film ones stll need developing. 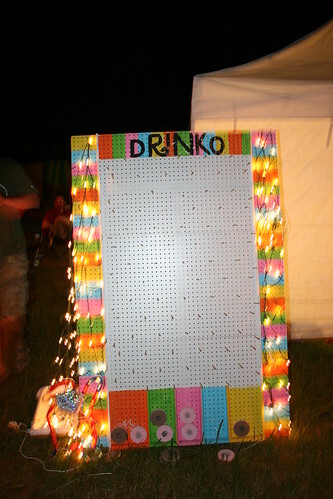 Drinko was a huge hit! Especially combined with Skittles Vodka and Vets! Processing lots of stuff with my e-course – funny enough, by NOT doing some of the exercises. Le sigh. It’s been stressful (mostly because of work deadlines) but they are done now, and I feel like I’ve been getting extra attention from my love in order to help eliminate stress 😀 Absolutely no complaints here. Life is good, just busy and hectic and fast right now. Trying to stay in the moment. Zen for the busy? Check out Leo’s post “The Mindfulness Guide for the Super Busy: How to Live Life to the Fullest“. Even though I’m not dedicating 30 days to it I may print it to hang up at work. No hoop/poi jam tonight – I’ll be celebrating Beltane around a fire with friends! But we’ll be back at the Morristown Green next Thursday. Do you have pig flu? Try checking here. And people, the CDC even says you don’t need a mask unless you are taking care of someone who IS sick! Wearing it in public just identifies you as the paranoid freak you are. Weekend plans: not entirely sure. Possible hang with someone friday, possible party saturday. Conclave on sunday. In between, car shopping, cleaning the bedroom, possibly a bottle of wine at the laundromat, and maybe even buying some soil/plants for the balcony. *goes back to first link* #3. Do less. Hmm. Through my travels to Burning Man and regional events, I’ve been exposed to a lot of new hobbies. I started with poi – never imagining I would one day set them on fire. Poi is a form of juggling one might say, that consists of balls or weights or wicks (for fire use) attached to chains or in socks (for practice only). You spin them around you in various patterns, which all look extremely complex but break down to basic movements that most people can learn. Some performers will always blow your mind with their creativity and flow! 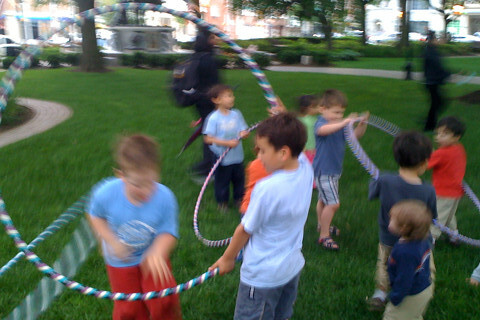 I also met a lot of hoopers – hula hooping, or more accurately hoop dancing, has come a long way from the Wham-0 days. I started trying to learn that as well, not so much out of a love for it but it was the most fun I had getting tired out (or, that evil word – “exercising”). Until one day, when goofing off to some really amazing music, I started to feel it. The magic within the hoop when it truly becomes a dance and the hoop is your partner. Since then, I’ve been practicing more and taking a workshop when I can. I am not in it to perform. The exercise isn’t the only reason I pick it up, but it makes me feel better afterward. It’s about having fun, and sometimes just a meditation while spinning, getting lost in the movement and rhythm of the music as the Sufis do. Recently hooping is less restricted to festivals and burners, and it’s becoming a trend as a fitness regime and hobby. The local community is growing, and while it’s more difficult in less urban areas to gather because we are spread out, hoopers are always looking to gather and spin together. Morristown is usually central to a lot of people, and I decided to start a public gathering here. It would be open to the public, and all forms of “skill toys” would be welcome – poi, hoop, devil sticks, contact juggling… I figured if I started a regular thing, it would continue on even when I couldn’t attend. And so Morristown’s first Hoop/Poi Jam was held last night on the Green. The call went out online to hoop communities, New Jersey burners, and emails to friends. I had no idea who would come, whether we would have people interested or annoyed at our presence, or what would happen. I was thrilled that my friend Danny and his dog Bo would be driving up – his Traveling Piano project brings a great energy to public areas as he creates amazing music, allows anyone to jump on the truck and play, and talks at length with everyone who stops by. It’s not the typical music most hoopers or poi spinners listen to, but it has it’s own beauty and flow that is a unique experience and I know I enjoyed those moments I got lost in it. Danny has been playing so long that he improvises pieces you would swear took ages to compose, but as I overheard him telling others – it’s not about the notes, or if you miss one or hit the wrong one. It’s about the journey and how you get there, and being in the moment. He’s talking about the musical “flow” – the same flow I felt for the first time in the hoop last summer, the flow that beginners of any skill toy struggle with as they try to learn the basics (or the notes). Learning the basic moves uses a different part of the brain, and it’s necessary. But once those moves start to feel comfortable, your muscles remember them and you don’t have to concentrate as hard. And one day, you start flowing and improvising – when someone asks what/how you did a move, you don’t even remember what move it was, you just remember the feeling of being lost in spinning circles. In the end, several good friends of mine came, some online friends who I hadn’t met in person yet, and we met some amazing people passing by – many tried either to hoop or the piano or both! The night chill and our empty stomachs drove us to end the night and look forward to future jams, as the weather gets warmer and evenings get longer. Want to join us? Come by on the First and Third Thursday of each month at the Morristown Green. I don’t get there until 6:30 or so, but everyone is welcome to arrive earlier if they’d like. Next one is May 7 – I may end up adding one between now and then since it’s 3 weeks away. We will usually have extra equipment to share, but please ask before using anything and be sure to leave it with us when you go. Musicians welcome! Danny can’t always be here, so feel free to come hang out with us if you’d like to play!